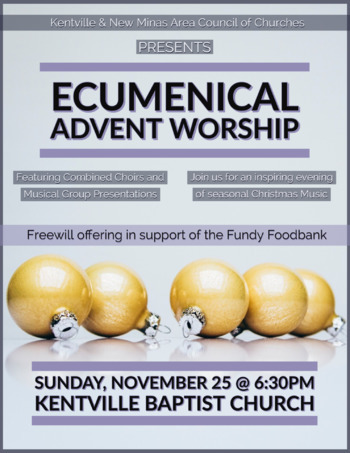 Annual musical service featuring choirs and musical groups and more from 14 participating area churches, as well as a combined choir of more than 125 voices from the Kentville and New Minas Area Council of Churches. Freewill offering for Foodbank. All contributions are tax-deductible, please make cheques payable to “Fundy Interchurch Foodbank”. All are welcome.